Americans are in worse health than their peers in other high-income democracies, according to a report released by the National Research Council and the Institute of Medicine. The report was looking at why, when America pays more for health care than any other nation, do Americans experience shorter life expectancy and increased mortality rates. In fact, the study found that the U.S. increases in poverty and income inequality, including child poverty, have correlated with the worsening of social and health outcomes for the American population overall. While not a clear causal pattern, the report states that these “unsettling trends present a potentially important explanation for the U.S. health disadvantage.” The report argues that health is connected to larger systematic issues such as social inequality, social mobility, unemployment, built food and physical environments, and patterns of food consumption. While there is not sufficient current research on the impact of these structural factors on health, these issues greatly influence individual behaviors. Due to the strength of the data and the current detrimental conditions, the report advocates for more innovative policies and public – private partnerships that could impact our physical food and health environments. This includes increasing opportunities to give individuals and communities the tools and access to healthy food and living decisions while also improving the nutritional quality of our food supply. These issues are just what the Healthy Food Financing Initiative Programs forwarded by the CDFI Fund are tackling now. Yesterday we posted a video that illustrated the huge problem of wealth inequality in the United States. We have blogged before about the growing divide between the wealthy and the poor, between urban and rural, and between big business and main street. Now, Demos has published a report looking at one of the main things fueling these troubling trends: the rise in political inequality. While this has been implicit in many of our blog posts, Demos has done a good job explaining how political power and access undergird the policies and systems that perpetuate growing inequality. The report explains that the political priorities of the wealthy diverge significantly from the general public in regard to a range of issues, including taxes, trade and globalization, business regulation, social safety net programs, and the role of government. 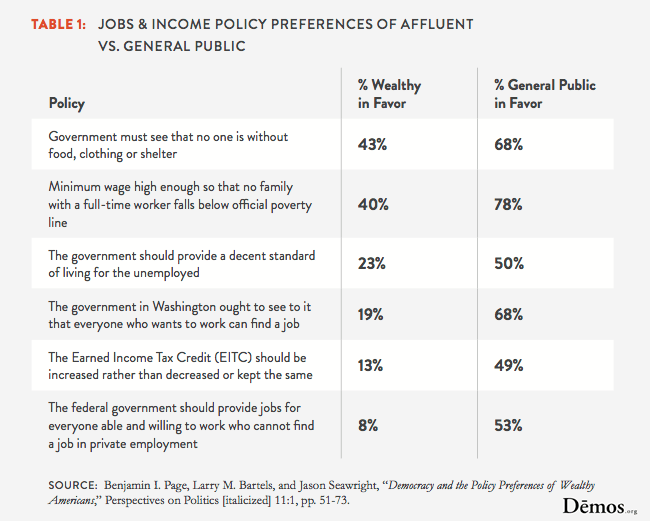 While the general public favors policies that would level the playing field and begin to reverse some inequality, the wealthy are generally less in favor of these policies. Demos reports that while these groups do not disagree on everything, the biggest divergence occurs in areas of economic policy. For example, while most Americans are concerned about job creation, the wealthy place a higher priority on deficit reduction. One of the reasons that is cited for this difference is that the affluent have not been as affected by the economic downturn and the rise in unemployment. Back in August, we had discussed that because the affluent and the political elite had not experienced the severity of Great Recession, as compared to the majority of Americans, their priorities do not align with what most Americans need. The findings of the Demos report provide more support for this argument. Lower-income Americans have significantly less influence on public policy outcomes. They participate less in civic life (such as in voting– low-income voters turn out at far lower rates than higher-income voters), are under-represented among elected officials, and do not contribute as much to political campaigns. As a result, their priorities are not reflected in policy outcomes. Growing economic inequality is typically blamed on structural changes in the economy, such as globalization. But it is becoming ever clearer that the tilted playing field of U.S. politics, with affluent voices speaking most loudly, is itself a driver of inequality. The report also lays out three solutions: reduce economic inequality, reduce the influence of big money in politics, and encourage more civic participation by ordinary Americans. As the report points out, those that are in most need of government programs and services, and those who are most impacted by public policy decisions, are the ones whose voices are least heard. People from all walks of life and all income levels should be educated and encouraged to participate in civic life. There’s a role to play for all of us in reversing this trend and allowing all voices to be heard in our political process. A YouTube video has been making the rounds recently on the wealth gap in America. If you haven’t seen it yet, you should. It does a great job illustrating what Americans think wealth distribution look like in the U.S., how it should ideally be, and what it actually is. Sadly, the reality of the wealth gap, as we’ve discussed numerous times before, is that it continues to grow. In related news, the News & Observer reports that fewer and fewer families are saving for their children’s college education. A recent survey by Sallie Mae found that only 50 percent of parents with children under the age of 18 were saving for college, down from 60 percent in 2010. Half of these parents said they were instead working on paying off debt and rebuilding their retirement and other savings. In addition, many parents are falling short of the goals they set out for college savings– leaving a “savings gap” between the amount they want to have saved and the amount they actually will save by the time their children enter college. So while the wealth gap in the United States continues to grow, the traditional avenues for advancement become more out of reach, such as college education. Not only have families’ ability to earn and save been eroded, but the cost of education has skyrocketed. These trends together mean that unless we do something to address the structural inequities build into our economy and our social, educational, financial, and other institutions and systems we will continue to see the rich get exponentially richer while the rest of us struggle to just stay afloat. 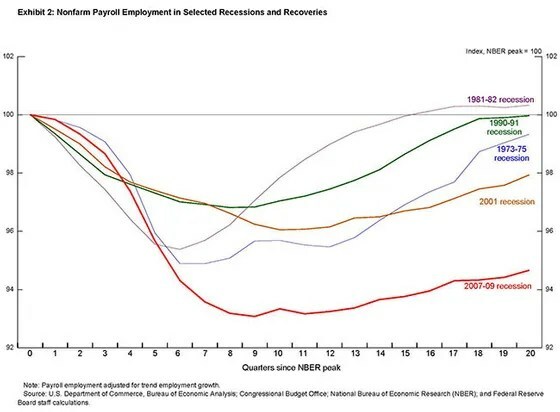 This are certainly not the ingredients for an economic recovery. CNN reports today that personal incomes saw the biggest one-month decrease in 20 years, dropping 3,6 percent or $505.5 billion from December. There are a few reasons for this. First, the fiscal cliff negotiations at the end of last year and the rise in corporate income taxes that took place on January 1 meant that corporations paid out dividends to their shareholders before the end of 2012 so that they wouldn’t have to pay the higher taxes. This essentially inflated the Commerce Department’s personal income numbers for December. Second, the expiration of the payroll tax, which includes the amount of income that is deducted for things like Social Security and Medicare. The Commerce Department excludes these amounts when determining personal income, so this decreased the personal income numbers for January. These two factors together account for the severe drop in incomes between December and January. They also illustrate the dramatic effect that public policy can have on our economy. The sequester is in effect as of today, and the impact of these funding cuts will have significant and far-reaching impacts across our economy and in every community. Consumer spending, which drives our economy, is only able to increase if people have money to spend. CNN also reports that gas prices increased by 10 percent in February. So while we have an increase in costs, we are also cutting essential programs— unemployment benefits, Medicaid, child care subsidies, rental assistance small business contracts, education, workforce training, etc– that help people gain economic security. This is especially true in difficult economies, and as we’ve said before although we’re in a period of recovery, many communities are still struggling. But just as public policy can incent corporations and individuals to behave in ways that do not benefit the common good, public policy can also be crafted in ways to level the playing field, provide a safety net, and encourage fairness and equity.